Shoes and handbags were the focus of this fashion editorial I shot for the February/March 2015 Issue of Auxiliary Magazine but to really show them off we considered the whole look, clothing, hair, and makeup. Fashion stylist Shannon Kramp, makeup artist Elizabeth Rhodes, and hair stylist Cassandra Lyons made an excellent team. I shot this editorial in studio to create a clean background for the bold looks from YRU, Privileged, Iron Fist, Cats Like Us, and Lip Service and pulled furniture props from OffBeat Emporium. 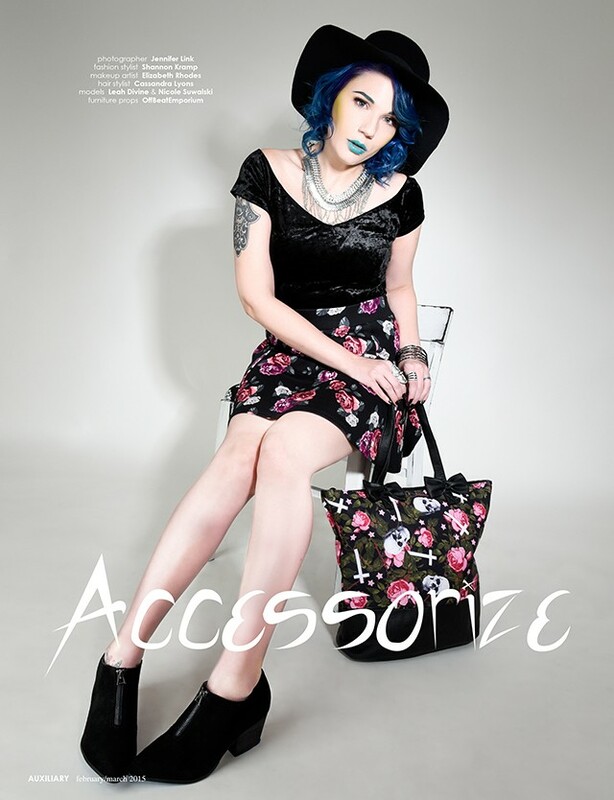 This fashion accessory editorial was shot for and published in the October/November 2013 Issue of Auxiliary Magazine. It was fun just focusing on shoes and accessories, the makeup and hair time was cut out, and it was just loads of shoes from T.U.K. Shoes, Hades Footwear, and Fluevog plus some awesome leggings from Carousel Ink. It was hard giving these pulls back!